PhotoImpro is all-in-one imaging suite - image editor, enhancer, browser, viewer with full-featured batch mode. Users gain a wide range of abilities to restore and adjust photos, elaborate them using over 80 filters and effects, fix common photographic problems (such as red eye), share their digital memories with loved ones via printing, burning photos onto CDs or publishing them online for free, and organize them for quick retrieval and viewing. PhotoImpro is a full-featured batch image editor software application. This feature is easy-to-use, you do not have to understand programming or even scripting in order to perform the batch processing tasks. Just select the files you wish to process, choose the operation for the processing task, and you are ready to go! Some photos capture a moment that can never be repeated. If there are some defects in your photo, PhotoImpro can help you remove them, saving your precious memories for a lifetime of enjoyment. You can improve photos by applying image adjustments like color correction, brightness, contrast, desaturation and more. Photos with too much noise can be restored with the denoise option. If a photo is blurred or unfocused, the focus corrector can remove these defects. And, of course, there is a red-eye remover to make faces look friendlier! Synchronize income and expenditure - and optimize your budget - graphically! Graphics Converter Pro is a powerful image viewer and batch graphics converter. Qweas is providing links to AmitySource PhotoImpro 1.5 as a courtesy, and makes no representations regarding AmitySource PhotoImpro or any other applications or any information related thereto. Any questions, complaints or claims regarding this application AmitySource PhotoImpro 1.5 must be directed to the appropriate software vendor. 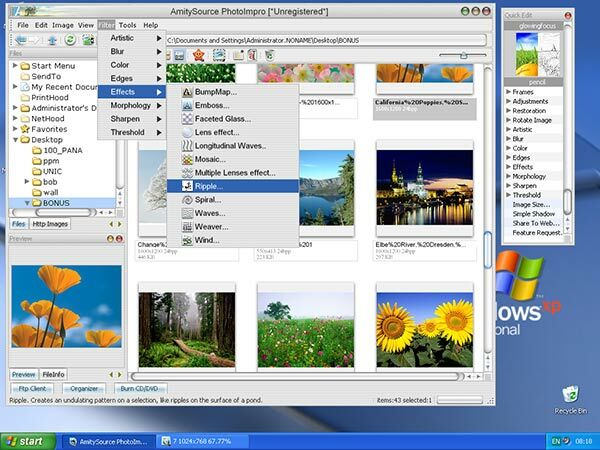 You may click the publisher link of AmitySource PhotoImpro on the top of this page to get more details about the vendor.